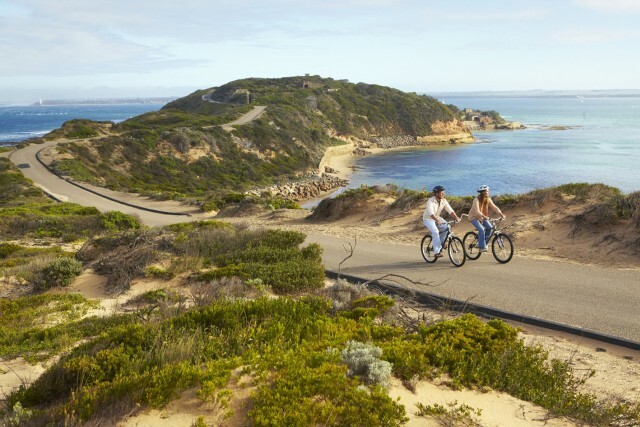 Our cycling tour is the perfect way to explore the beautiful Point Nepean National Park. All of our tour guides have a detailed knowledge of the area and its history, making it the ideal way to experience the National Park. This bike tour is suitable for cyclists aged 8 years and over with a reasonable level of fitness and cycling ability. Within the park, you will ride to many historic sites. The first stop is the old Quarantine Station area – a site with buildings dating back to the mid 19th Century. It was used to prevent the spread of dangerous diseases, house troops during World War II and protect ethnic Albanians fleeing the Balkans conflict in the 1990’s. You will then move on to visit the historic Cattle Jetty, Pearce Barracks and Eagles Nest. Next, you will ride out to Fort Nepean, located at the end of the southern end Mornington Peninsula. Fort Nepean helped make Melbourne the most well-defended city in Australia’s. You’ll be able to hop off your bikes and explore the vast tunnels of the fortress that were used during the first and second World Wars. Not to mention the breathtaking lookout points where Bass Strait meets Port Phillip. Then after some light refreshments, you hop back on your bike and head home via Cheviot Hill, the mysterious beach where the then Prime Minister Harold Holt vanished in 1967. 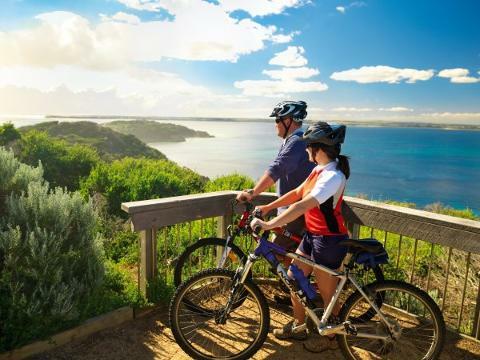 Wildlife is also a highlight of the tour - lucky cyclists may spot Bottlenose Dolphins frolicking in the water, Australian Fur Seals playing out on rock formations, Echidnas meandering along Coles Track (a scenic bike path), Rosellas give the sky a dash of colour around Quarantine station and much more. The tour will take about 2 hours (it may be longer, depending on group size and cycling ability). Our guides will give commentary of historic sites, the natural environment and lead you to the best viewing points for photo opportunities. 10.00am - 12pm daily. Tour times may vary depending on numbers and demand. If you have a preferred time for your group, please let us know. Groups bookings are tailored to your requirements where possible. Meet your guide at Bayplay Tours , 3755 Point Nepean Road, Portsea . All Day parking is behind the building or up Franklin Road between December and April . Commentary from your knowledgeable and experienced guide. Many photo opportunities from the best vantage points around Point Nepean. First aid supplies, safety equipment and a mobile phone via your guide. You should bring a backpack for personal items – camera, mobile phone, sunscreen and water bottle. A hat, sunglasses, comfortable riding clothes and closed heel shoes are essential. You are welcome to bring along your personal bike helmet or bike if you prefer. You should definitely bring your enthusiastic sense of adventure! Participants need to be at least 8 years and of age and of reasonable fitness/confidence level. The pace of the trip is controlled carefully so as to maximise enjoyment and minimise effort. A sense of fun and adventure is your biggest asset. Children under 8 years can be catered for on private or family tours.